Walter Mosley is the author of the bestselling Easy Rawlins series, hard-boiled detective novels featuring a black private investigator in post WWII L.A. But he’s also dabbed successfuly in science fiction, with the novels Blue Light and The Wave, and the collection Futureland. So it wasn’t too much of a surprise to see a brand new Walter Mosley story in the latest issue of Apex. Here’s Stephanie Wexler’s take at Tangent Online. Read Stephanie’s complete review here. 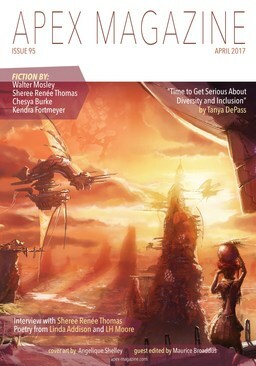 The April issue of Apex contains new fiction from Walter Mosley, Sheree Renée Thomas, Chesya Burke, and Kendra Fortmeyer, as well as poetry, a podcast, an editorial by guest editor Maurice Broaddus, an article on diversity by Tanya C. DePass, and interviews with Sheree Renée Thomas and cover artist Angelique Shelley. You can subscribe to Apex’s monthly podcast at iTunes. The marvelous cover is by Angelique Shelley. Apex Magazine is a monthly science fiction, fantasy, and horror publication featuring original short stories, poetry and non-fiction. It is edited by Jason Sizemore and Lesley Conner, and released the first Tuesday of every month. The Reprints Editor is Maurice Broaddus, and the Podcast Producer is Mahvesh Murad. We last covered Apex Magazine with the January 2017 issue. The complete issue is here, and you can buy back issues or subscribe at their website. Our April Fantasy Magazine Rack is here. See all of our recent fantasy magazine coverage here.